Interweaving of Spanish and Arab cultures, Cordoba, UNESCO World Heritage Site, is located at the foot of the Serra Morena and is bathed by the river Guadalquivir. Cordoba is an architectural masterpiece, visited by tourists from around the world who appreciate the beauty of its Arab-style buildings that remind visitors that the city has been for a long time the capital of the Muslim Empire in Spain. 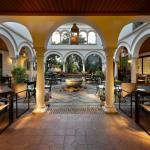 Visiting Cordoba means being absorbed in a world still strongly influenced by Arab culture. The evidence is the Mezquita, the great mosque, now Christchurch Cathedral, a unique mix of history, religion and architecture that has no equal. Not to be missed is the Alcazar (fortress) of the Catholic kings, with its gardens, fountains and Moorish baths, surrounded by four towers. The ancient walls once protected the city and they are still partly visible. The mixture of artistic styles that make the originality of Cordoba are also reflected in the cuisine, which mixes together the produce of the sea and land. Do not forget the natural environment in which the city is set: a green land - due to the presence of Guadalquivir - with wheat fields, vineyards and olive groves as far as the eye can see. The best natural areas are now protected in parks, the Hornachuelos, the Montoro-Cardeña, the Sierras Subbéticas. Two events you cannot miss if you want to breathe the spirit of Cordoba: the feast of Our Lady of Health, from May 25 to 31, and especially the Holy Week celebrations, with the procession of the various confraternities of the city. 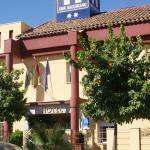 Maximiano Herculeo Hotel is located in Cordova, near the railway station and the bus station. 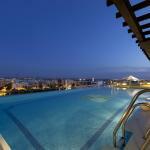 The hotel is centrally located with easy access to monuments including the famous mosque. 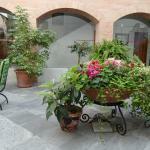 Hotel Maestre is located in the heart of Cordoba, near the famous Mosque. The hotel is housed in a typical residence of the city and is furnished in typical Andalusian style and boasts a beautiful courtyard. 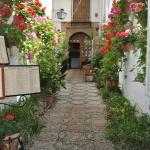 Los Patios is a pleasant hotel in the historical centre of Cordoba, in front of the tower of the mosque, not far from the main tourist attractions. It offers parking, reception open 24 hours on 24 and tour desk.